Two proposed bills – one allowing union re-certification elections and another ensuring labor contract language complies with the Supreme Court’s Janus decision – were filed with the House of Representatives and referred to the Labor and Public Employees Committee. An Act Concerning Public Employee Voting Rights would allow public-sector workers to vote to recertify their union every four years, choose another union to represent them, or form their own union. The proposed bill’s Statement of Purpose is “To protect public employees’ rights to elect a union of their choice to represent their interests. Recertification legislation passed in Iowa in 2017 and in Missouri and Florida in 2018. Although the language of each state bill differs slightly, it essentially means bargaining units would have the right to vote on which union represents them or choose to form an independent union. The second proposed bill – An Act Concerning Clear and Conspicuous Statements Regarding State and Municipal Employees’ Right to Opt Out of Union Membership – is a reaction to the 2018 Janus v. AFSCME decision by the Supreme Court and would require collective bargaining agreements to make clear employees’ resignation rights. The Opt-Out language bill is sponsored by a number of Republican representatives. Language included in collective bargaining agreements has come under scrutiny at the municipal level for not adhering to the Supreme Court’s Janus decision and ensuring public-sector workers are aware of how they can resign union membership if they choose. The Supreme Court in Janus v. AFSCME ruled that public sector employees can resign union membership without having to pay fees as a condition of employment. Rep. Craig Fishbein, who is sponsoring both bills and serves on Wallingford’s Town Council, has argued Wallingford’s municipal contracts do not include language making clear to employees their right to resign from the union. state Uniformed Professional Firefighters Association. Local 825 voted to de-certify from the statewide union but met resistance, eventually culminating in a court case. Local 825 won the ability to de-certify from the statewide affiliate, although they remain affiliated with the national union. The court case is moving forward with Local 825’s claim the UPFFA breached its fiduciary responsibility. “I hear from people all the time that they’re not happy with their labor union and feel like they could get better services if given the opportunity to re-certify on a periodic basis,” Fishbein said. The Labor and Public Employees Committee, however, may prove a difficult sell for the proposed legislation. 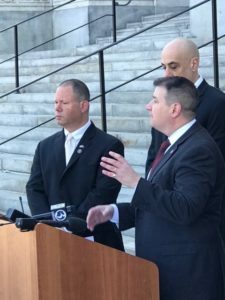 The Labor Committee includes six current and former union officials, such as Sen. Catherine Osten, D-Sprague, Rep. Michael Winkler, D-Vernon, and Rep. Joshua Hall, D-Hartford. The Labor Committee is also co-chaired by newly elected Sen. Julie Kushner, D-Danbury, who served as a union organizer and co-chairwoman of the Connecticut Working Families Party, a union-backed political organization. Fishbein is one of only five Republican members serving on the Labor Committee. “Public employees should have the right to vote for which organization represents them,” Fishbein said.